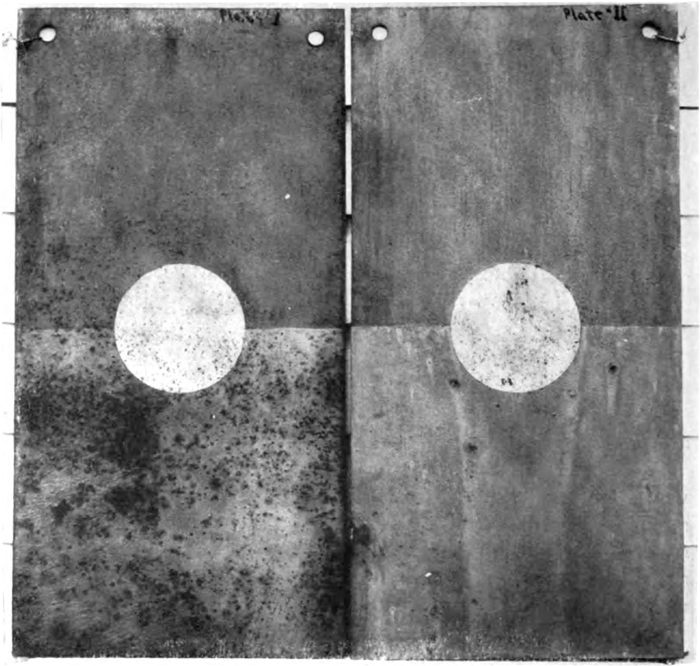 Tests illustrating comparative durability of one and two coats of two different types of war colors applied to steel plates. Exposed November, 1915, Washington, D.C.
Each plate given one coat of 94% Red Lead (a portion of which was not covered and is left bare as shown in circles). The upper half of Plates I and II were then given one and two coats respectively of Lead and Zinc Mixed Paint tinted to a Battleship Gray Color. The lower half of Plates I and II were given one and two coats respectively of Zinc and Barium Sulphate Paint tinted to a Battleship Gray Color. Image (at page 10) illustrating Henry A. Gardner, Marine Paints. Bulletin 52 (April 1916). Educational Bureau, Scientific Section, Paint Manufacturers’ Assocation of the U.S. Philadelphia Pennsylvania. Google scan of University of Chicago copy, digitized March 1, 2012. The context being, color effects and invisibility, the author favoring light-absorbing colors that present the lowest light-reflecting coefficients.